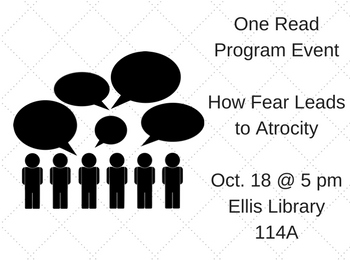 Join us on October 18th at 5 pm in Ellis Library 114A for the next event in our series about this year’s One Read Program pick, Infamy: The Shocking Story of the Japanese American Internment in World War II by Richard Reeves. A panel of MU faculty from a variety of departments to discuss how social, political, and psychological rationales can lead to discrimination and injustice. Panelists include Dr. Jamie Arndt from MU Psychology, Professor Sam Halabi from MU Law, and Dr. Earnest Perry from MU Journalism. The One Read Program, which promotes conversations regarding diversity, inclusion, and social justice through students, faculty, and staff reading a particular book together, is sponsored by Mizzou Law and Mizzou Libraries. For more information, see this guide or visit the exhibit through September 29. Copies of the book are available for checkout. Join us on October 6th at 12:30-2 pm in Hulston Hall 7 for the next event in our series about this year’s One Read Program pick, Infamy: The Shocking Story of the Japanese American Internment in World War II by Richard Reeves. 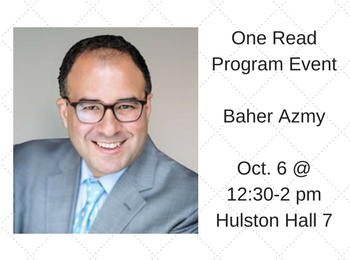 Baher Azmy, the Legal Director of the Center for Constitutional Rights, will present. He is known for his litigation and advocacy for civil and human rights, specifically the rights of Guantanamo detainees. He has additionally litigated cases challenging police misconduct and the violation of immigrant and prisoner rights. Snacks will be provided thanks to the Friends of the University of Missouri Libraries. Join us on September 25th at 1 pm in Hulston Hall 7 for the next event in our series about this year’s One Read Program pick, Infamy: The Shocking Story of the Japanese American Internment in World War II by Richard Reeves. 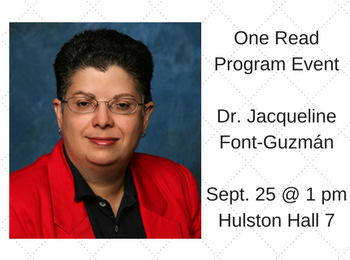 Dr. Jacqueline Font-Guzmán, a professor of Law at Creighton University and a certified mediator and arbitrator by the Puerto Rico Supreme Court, will present. Her research explores healthcare disparities, law, and conflict engagement in addition to how marginalized individuals create counter-narratives to address institutional injustice. Join us on September 6th at 1 pm in Hulston Hall 7 for the next event in our series about this year’s One Read Program pick, Infamy: The Shocking Story of the Japanese American Internment in World War II by Richard Reeves. 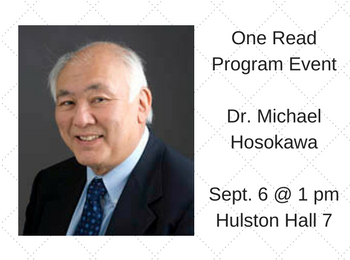 Dr. Michael Hosokawa, a Professor of Family and Community Medicine at the MU School of Medicine, will share his experience behind barbed wire in a Japanese-American internment camp during World War II. 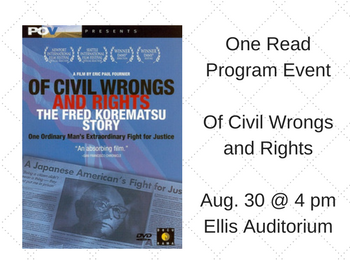 Join us on August 30th at 4 p.m. in Ellis Auditorium for a viewing of the PBS documentary Of Civil Wrongs and Rights: The Fred Korematsu Story. 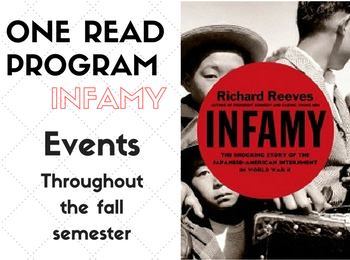 If you don’t have time to read this year’s One Read Program pick, Infamy: The Shocking Story of the Japanese American Internment in World War II by Richard Reeves, or if you want to learn more, this is the event for you. This PBS documentary tells the story of Japanese-American internment through the experience, resistance, and trial of Fred Korematsu. 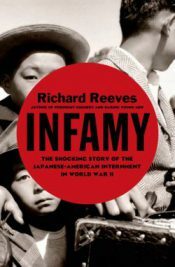 Infamy: The Shocking Story of the Japanese American Internment in World War II by Richard Reeves is this year's One Read Program selection. The One Read Program is sponsored by Mizzou Law and MU Libraries in order to facilitate conversations of diversity, inclusion, and social justice throughout the MU community. This year's selection, Infamy, tells the shameful story of the United States' forced relocation of thousands of Japanese-Americans to internment camps during the Second World War. 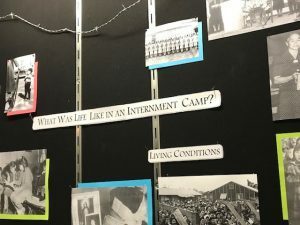 An exhibit in the Ellis Library Colonnade features a list of internment camps throughout U.S. history and a map of their locations. In addition to general information and a timeline of events relating Japanese-American internment, photos capturing various elements of life in the camps show viewers a glimpse of this reprehensible part of our history. Examples of propaganda from the time are also highlighted. The exhibit will be on display through September 29. For more information on the book, events, additional resources, and information on the One Read Program, see this guide. Copies of the book are available for checkout in Ellis Library, the Journalism Library, and the Law Library. The following events have been scheduled to facilitate conversation regarding this year’s One Read Program selection: Infamy: The Shocking Story of the Japanese American Internment in World War II by Richard Reeves. Infamy tells the shameful story of the United States’ forced relocation of thousands of Japanese-Americans to internment camps during the Second World War. If you don’t have time to read Infamy or if you want to learn more, this is the event for you. This PBS documentary tells the story of Japanese-American internment through the experience, resistance, and trial of Fred Korematsu. Dr. Hosokawa, a Professor of Family and Community Medicine at the MU School of Medicine, will share his experience behind barbed wire in a Japanese-American internment camp during World War II. Dr. Font-Guzmán is a professor of Law at Creighton University and is a certified mediator and arbitrator by the Puerto Rico Supreme Court. Her research explores healthcare disparities, law, and conflict engagement in addition to how marginalized individuals create counter-narratives to address institutional injustice. Baher Azmy is the Legal Director of the Center for Constitutional Rights and is known for his litigation and advocacy for civil and human rights, specifically the rights of Guantanamo detainees. He has additionally litigated cases challenging police misconduct and the violation of immigrant and prisoner rights. Join a panel of MU faculty from a variety of departments to discuss how social, political, and psychological rationales can lead to discrimination and injustice. 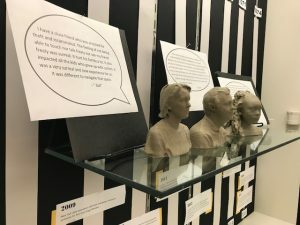 The One Read Program, which promotes conversations regarding diversity, inclusion, and social justice through students, faculty, and staff reading a particular book together, is sponsored by Mizzou Law and MU Libraries. 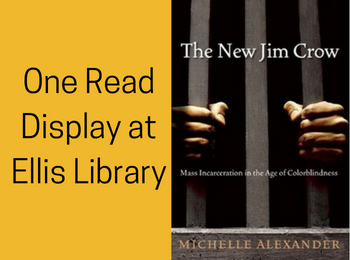 For more information on the book, events, additional resources, and information on the One Read Program, see this guide or check out the exhibit in the Ellis Library Colonnade through September 29. Copies of the book are available for checkout in Ellis Library, the Journalism Library, and the Law Library.